In Chapter 2 of Not the Way It’s Supposed to Be, Cornelius Plantinga, Jr. lays out an explanation of the corrupting power of sin in the world and in human life. He posits that it is a type of “uncreation,” rendering everything it touches filthy and unwholesome. As with the concept of shalom described in Chapter 1, I like this idea in theory, but the ramifications set my teeth on edge. Working from the assumption in the first chapter that we live in a corrupt world (as opposed to a fallen one), Plantinga is forced to reconcile the facts that good people do bad things and that bad people do good things. I think it is somewhat easier (and less soul-destroying) to believe that the light of Christ, which lights every person, is active in all of us from our birth to a greater or lesser degree depending on how much we allow it to work in us. Our mortal bodies, which do exist in a fallen state, are subject to physical decay and moral temptation, but our spirits can be stronger than our bodies. Sin and corruption are choices that we make, not states of being. There is a failing in this view, which is that because the world is a fallen place, many people are born into situations in which they have little choice of whether to become “good” or “evil” due to their surroundings and the people who have control over them. For example, a child soldier in Uganda has few options in life other than to do as he is told or suffer the death of his family members or himself. This is an extreme example. Let me give one that is more pertinent to American readers sitting in front of their laptops reading this in their comfortable homes. A child who is continuously exposed to messages from peers or caregivers or media that he or she is not as smart or attractive or as valuable as someone else will have little choice but to grow up with mistaken beliefs about himself or herself, about relationships, and about the world in general. This may cause that child to act in ways that objectively appear to be sinful. I think that the discussion of the next chapter will be the more appropriate place for hashing out this dilemma. For the purposes of this discussion, Plantinga and I agree that this and other similar sorry circumstances are not God’s plan for humanity. I believe that we disagree in that he seems to consider this sort of situation to be the inevitable result of human weakness and that we can truly do no good of ourselves, whereas I believe, with Joseph Smith, that people “should be anxiously engaged in a good cause and do many things of their own free will, and bring to pass much righteousness; For the power is in them, wherein they are agents unto themselves. And inasmuch as men do good they shall in nowise lose their reward” (Doctrine and Covenants 58:27-28). I find myself perplexed by Plantinga’s apparent need to erase human individuality in favor of “distinction-within-unity,” which seems to me to be another species of the “God is a cloud” theology (theosophy?) that I cannot reconcile with my view. My understanding, based on the LDS view, is that we are literal spirit children of God, and that like any good parent, He wants us to grow, develop, and maintain a personality and life of our own. He sends His spirit children to Earth to gain bodies which we are to train to use in service to Him and to our spirit brothers and sisters to the extent that we know how and are able to do so. If we were truly created rather than born, as Plantinga seems to believe, and if the measure of our creation is merely to “long for” God so that we may then “glorify and enjoy Him forever,” we are no more than mirrors that God made to admire himself in. Mark 8:35 (“whosoever will lose his life… shall save it”) does not mean that we become mere reflections of God, but rather that we become more fully ourselves, with our own distinct, unique personalities and traits intact, only turned to the service of God and our fellow beings. If this is what Plantinga means, then I like it. However, his argument strays dangerously close to saying that what makes us unique and distinct is in actuality corrupt and unsound and that we need to get rid of it. Post by Villate on loafingcactus.com. 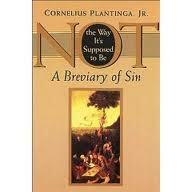 We are reading one chapter per month of Not the Way Its Supposed to Be by Cornelius Plantinga, Jr. The kick-off post contains a list of links to all the posts in this series.